So when the UPS truck did show up with it, he put it into the van for me, so that we could "make an entrance" with it later, making it a really big deal. Opening up the big gigantic box from Guidecraft was quite a production, and I really wish I had gotten at least a photo of Trina's face when she saw what was actually inside. Video would have been better. She squealed, she nearly cried. Richard was incredibly excited as well. My big three boys (14, 12, 10) went and found the power screwdriver, pulled out the directions, and started inventorying the parts. Then they went to work putting it together... something else I should have photographed. It took probably an hour and a half or so, but they got it together really well, and without problems. It would have taken ME far longer. Their only comment was that this would have been awfully time-consuming with just a regular screwdriver. And then Trina and Richard got to play. Trina insisted on getting on her apron, and will not "work" in her kitchen without it. Richard has no such rules. 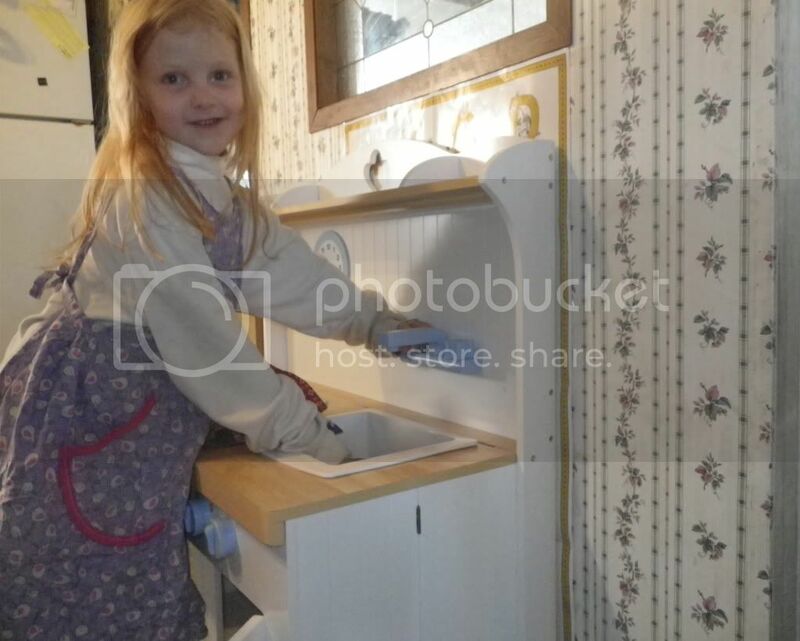 Trina particularly loves washing dishes... and the faucets are so cute! In the picture above, you can see the hinge where this all folds up. I did not get a photo of it all folded, so I'll use one from the website... so below you can see it all folded up and going under a bed. That is just the coolest thing! So instead of it always having to take up a huge bunch of space, you can store it away. Now, folding it up is reasonably straightforward, but it isn't so easy that I'd be putting it away every night or anything. Just an fyi on that. But my kids all figured out how to do it, so it is now pretty easy for me!! What I love about this kitchen is that it is giving both Richard and Trina the chance to pretend. Trina tends to "make" meals that I have just made, and she spends a lot of time washing dishes. To her credit, she does some of that for real too. But imaginative, pretend play is so important... and while none of my kids have had problems creating pretend worlds for their pretend play, a high-quality resource like this makes it a lot more fun for everyone. Richard spends a lot of time setting the clock to the right time. It makes him a little crazy when it says something completely different from reality. Guidecraft has some amazing products, and if the others are as sturdy and well-constructed as this one, they are worth every penny. I have my eye on the Greek blocks. Merry Christmas, kids? The Hideaway Country Kitchen is available for $200, and there is also another hideaway kitchen available. That one looks really pink though, so I am thrilled that we have this one. Disclaimer: As part of the TOS Homeschool Review Crew, I did receive this amazing kitchen in exchange for my review of the product. All opinions are my own, and receiving complimentary products does not factor in to my opinions. For more about my take on reviews, visit my blog post here. I'm so jealous!! This looks fantastic. Peanut would absolutely LOVE it. 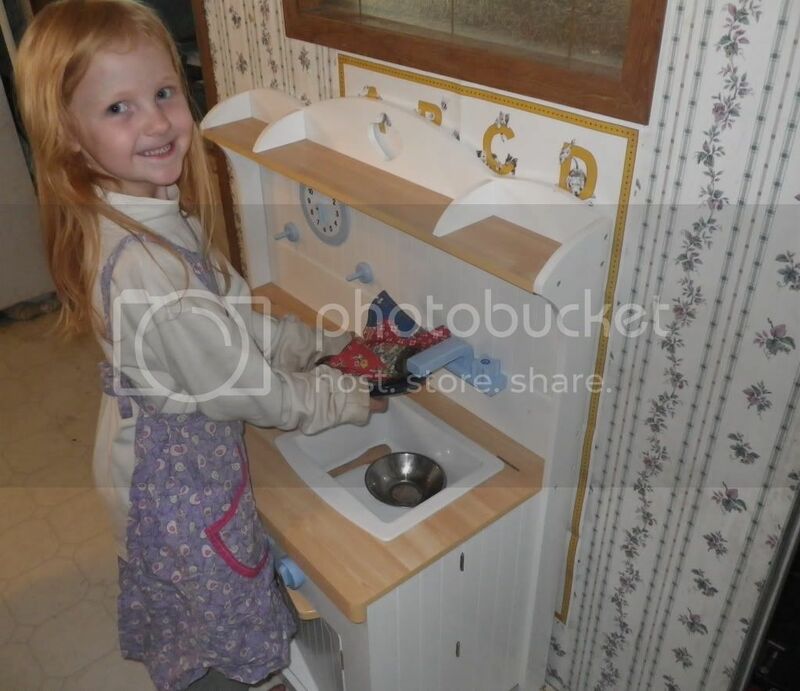 We got rid of the bulky plastic toy kitchen we had when the Dancer was little and she's always wanted one. I totally love that it folds up for storage...a must in my book since we have nowhere to keep one set up permanently! My sixteen year old daughter is jealous of your kids! 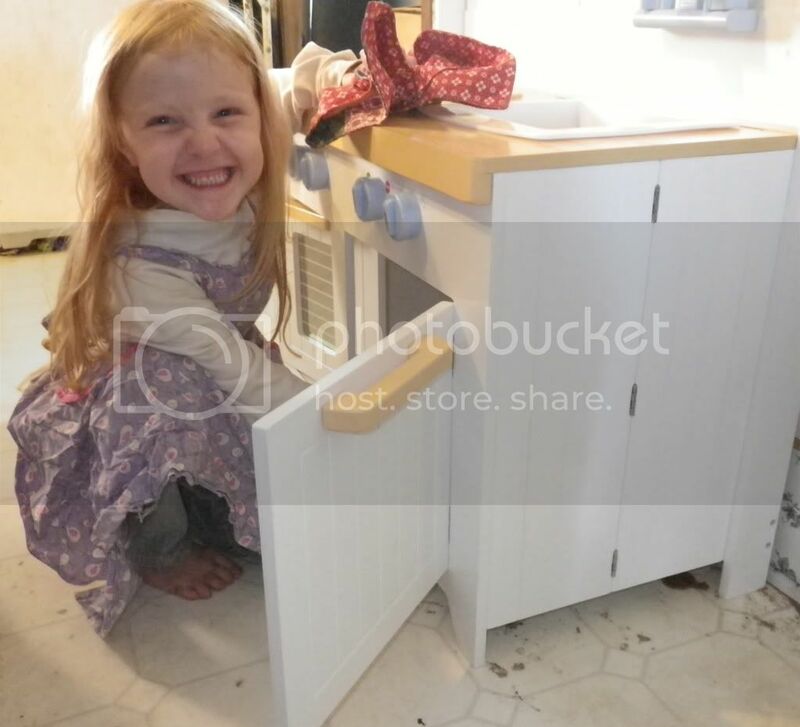 All she ever wanted as a little girls was a "real" play kitchen and we didn't have room for one! This would have been perfect! Debra -- in looking at the website I really like that face out bookshelf. It is perfect for young children because they can see the books and that alone will generate interest! I had a cardboard one long ago and traded the library out each week. This company makes me eager for grandchildren! Excellent review, mama! I also realized that I need to clean my carpets if I'm going to take pics and post them on the blog, so don't feel bad about your muddy floor! It's so nice to see pictures of Trina! Oh my word! This is too precious! I love how it can be stored under the bed if you NEED to do that! I didn't even notice the muddy floor. I was too busy drooling over the hideway kitchen. Trina is adorable! I seriously thought about retaking the photos when I saw the mud, LOL, but decided if I strive for anything on this blog, it is to be real. And Alane... I am really trying to get more photos of all the kids in here this year. I'm so bad at taking pictures... and even worse at actually doing SOMETHING with them.